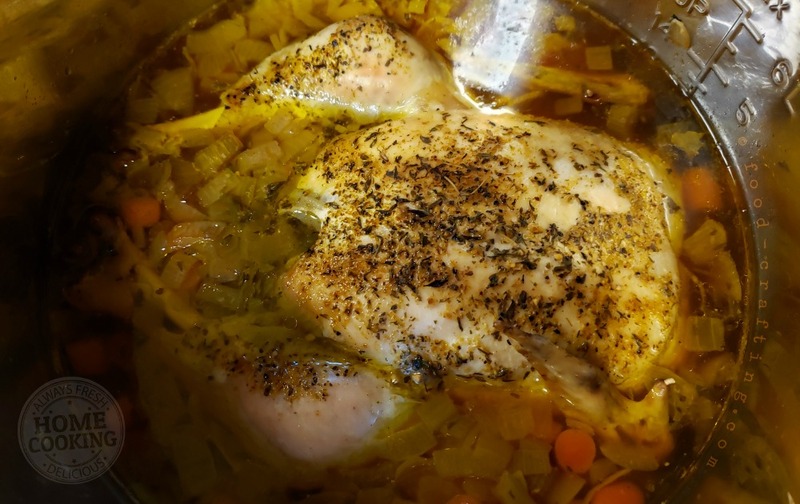 French Poule Au Pot Soup: Easy Instant Pot Meal King Henri Would Savor Any Day! 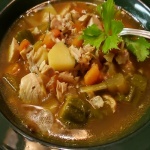 French Poule Au Pot Soup – Poule au pot is not technically a soup. Considered the main dish, it is a quintessential and very traditional Sunday dinner in French country homes. But this country girl never leaves well enough alone in the kitchen or in any recipe. So I made soup instead. I first heard about this traditional dish memorizing my history lessons in grade school! Yes, this chicken dish is mentioned in French history books. 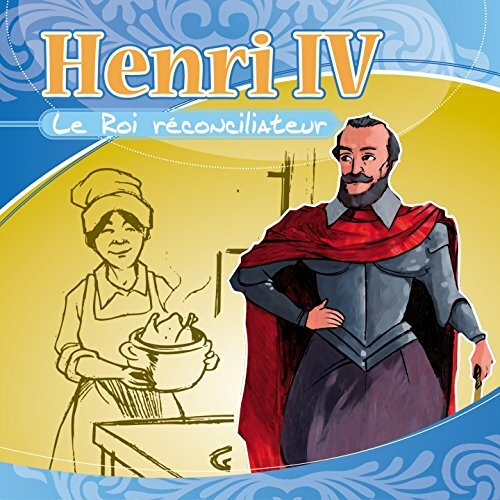 In an effort to boost the late 16th century economy of France after a long period of unrest, Good King Henri IV hatched an idea! Why not give his “citoyens” the ability to enjoy chicken in a pot every Sunday? Myth or reality, we have to thank him and Sully for a memorable meal. Chicken in the pot. It’s the literal translation of “poule au pot”. You have to admit, it’s a great political slogan for the times. I doubt it would work today. Does France Have A National Dish? Between the late 16th century and the beginning of the 17th century, it becomes the closest thing to a national dish! Natural and definitely organic poultry running around free… yes, the organic free-range chickens of yesterday. These days, the organic whole chicken is plump, great tasting, expensive and readily available in supermarkets. I am adapting this and other old fashioned, often time-consuming recipes to the Instant Pot® so that I can prepare the recipes more often. 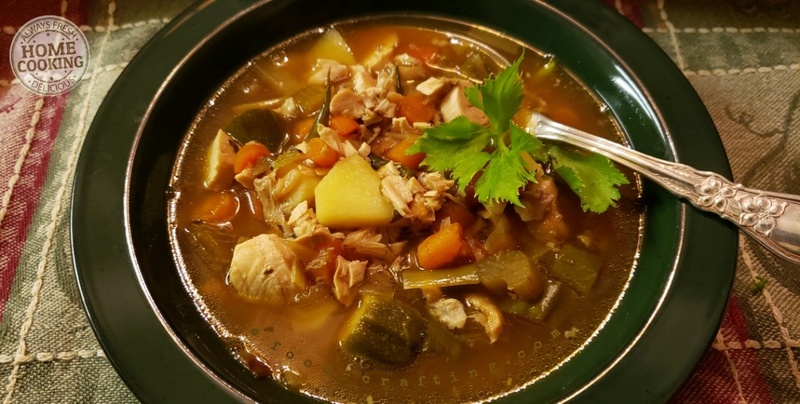 Depending on the ingredients and the “cuisinière”, poule au pot soup is a recipe that can and is adapted to each region of France. But… the chicken has to fit the Instant Pot®. #1 order of business. Five pounds is about the maximum weight. 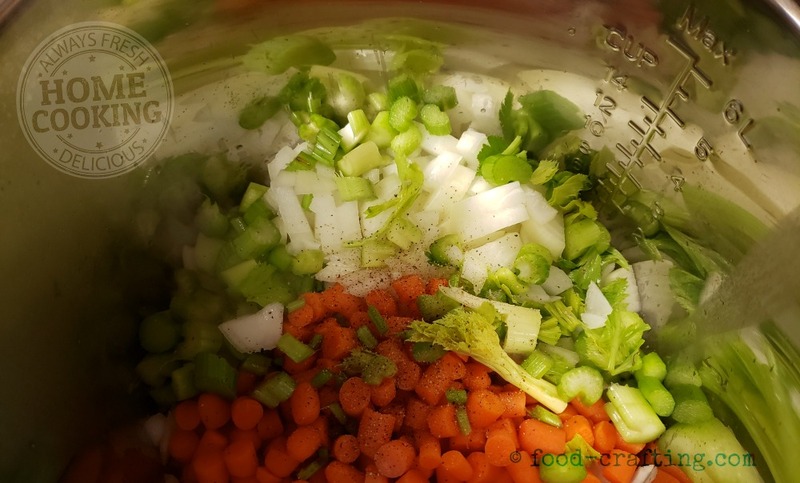 When you prepare this soup, don’t limit yourself to the basic soup veggies like onions, carrots, and celery. My soup includes refrigerator finds! 3 Ways To Enjoy This Soup! This is a hearty soup packed with protein, tender morsels of chicken and plenty of vegetables. Enjoy it as a chicken based vegetable soup, a hearty soup with plump pieces of chicken or as a creamed soup. How about as a vegetable soup finished in a soup blender then topped with croutons? Why Is Organic Chicken So Good For What Ails Us? During the past couple of years, much of my cooking has involved preparing meals for my elderly Maman. She is on multiple special diets but – within reason – why not make those restrictive meals more interesting to the taste buds? It is also my way of sneaking in all the protein and vegetables she now has difficulty preparing on her own. 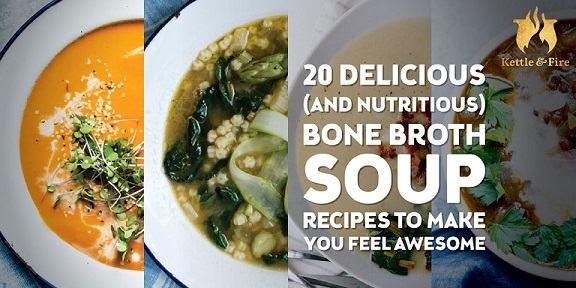 Support skin, joint, and gut health with bone broth & soups. Here are just a few reasons why I make this type of soup for her. Organic chicken is a yummy source of protein for those on any diet. 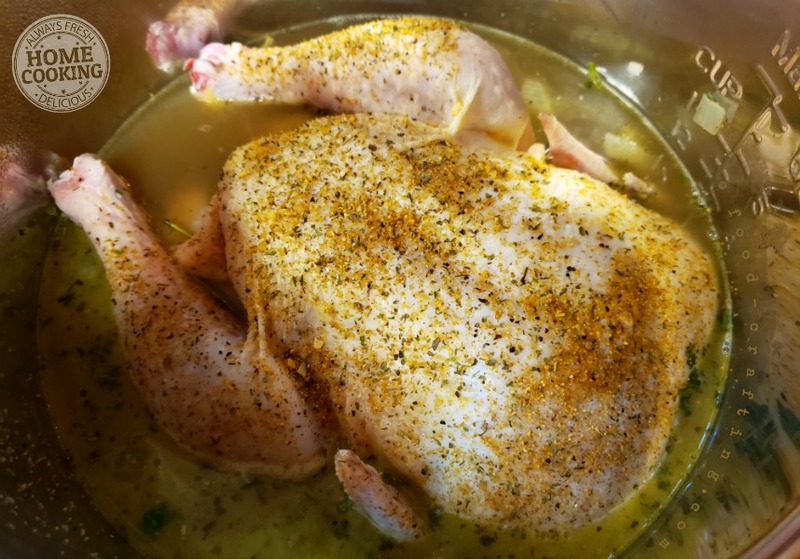 Using organic bone broth instead of regular chicken stock multiplies the protein value and increases her intake of liquids. Lean meat gives her energy and helps repair weak muscles. It is packed with vitamins and minerals. She can definitely use the calcium to keep bones strong and help with osteoporosis. Tryptophan helps reduce the constant stress. Last but not least, the meat just tastes better and the bone broth gives the soup a deep, rich flavor. I do not need to worry about which meats or vegetables to prepare. More than any other restriction, I have to worry about the sodium content of the meals. After spending a good amount of time comparing soup stocks, I set out to compare the sodium content of bone broths and found a similar discrepancy in each brand. They ALL taste good. It’s just a matter of how much salt goes into the soup stock or bone broth if we also season the vegetables and the meat. You have to season ingredients as you prepare the recipe. There is no “seasoning” after the cooking process – at least not in my kitchen. 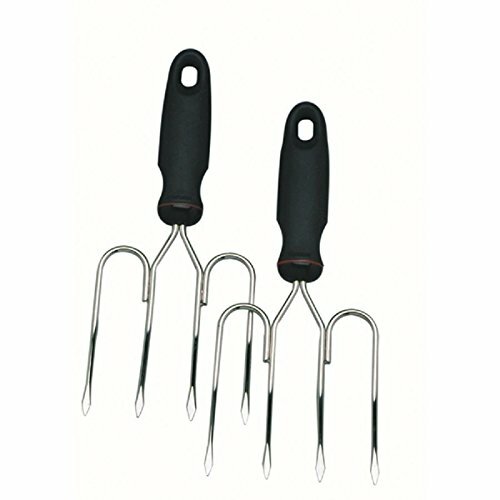 You can adjust seasonings such salt, pepper and certain herbs without any problem after the initial cooking period. Organics® Organic Bone Broth with only 95 mg of sodium and 9 grams of protein per 32 oz. carton. The others would taste just as good. I needed two containers of broth to make 6 hearty servings of soup. Zoup® bone broth came in 2nd place with 287 mg of sodium and 2 grams of protein per 31 oz jar. It is also hormone free, GMO-free and gluten-free (something I have watch for Mom) with 0 fat. Swanson® organic came in 3rd place with 430 mg of sodium and 9 grams of protein but it is Gluten and Fat-free! 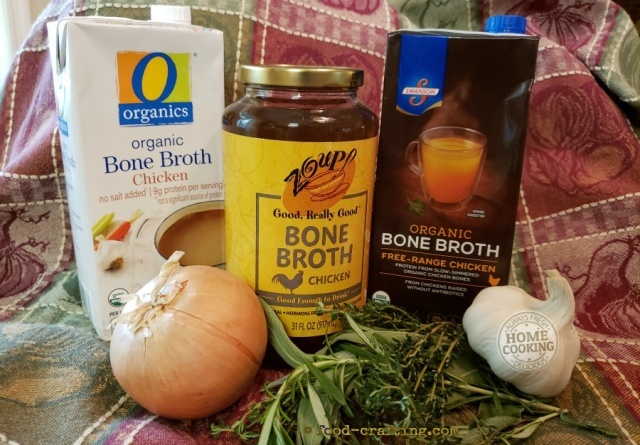 Last but not least, why not make your own bone broth? The crockpot or Instant Pot® make easy work of it if you know where to find the perfect bones to prepare the broth. 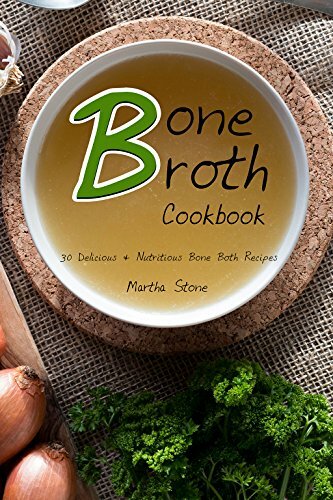 The next chicken soup I cook will be made with Kettle & Fire Mushroom Chicken Bone Broth. Kettle & Fire checks off all the must-haves – gluten free, high protein content, collagen and apple cider vinegar. I prepare meals for my elderly mother. Are you cooking for seniors? Select ready made meals for breakfast, lunch and dinner! These are healthy meals designed by doctors and prepared by top chefs. 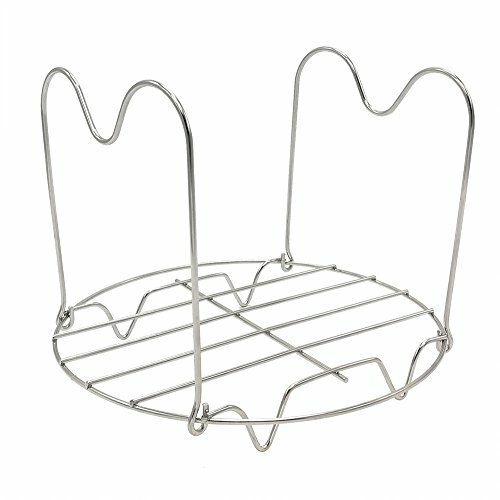 Peace of mind for the cook and delicious meals for Mom or Dad! Poule au Pot (aka Chicken In A Pot) is the quintessential French country meal. It IS Sunday dinner! “Good, Really Good”® chicken bone broth 31 oz. jar. Peel the onion and dice evenly. Dice the baby carrots carefully! I used nearly a whole 16 oz bag. Clean and chop an entire small heart of celery including the leaves. Add 1 good drizzle of olive oil to the pot along with two tablespoons of butter. Set the Instant Pot® to “Sauté” and when the butter is melted, add the veggies and sauté for about 3 to 4 minutes. Do not allow to brown. Cancel the cycle while you prepare the meat. Stir the veggies to distribute evenly across the bottom of the pot. Season the cavity of the chicken with some salt and pepper then stuff with the poultry blend herbs. Season the outside of the chicken with Montreal seasonings. Place the chicken on the bed of vegetables. Carefully pour the chicken bone broth around the chicken to reach the 10 cup level. Set the Instant Pot® to “Soup” function and cook for the preset time. No need to adjust the setting as it worked perfectly for this size chicken. The image below shows the result. The chicken is still in one piece and the vegetables are still in whole pieces. Carefully remove the chicken from the pot. I say carefully because it did come apart as I lifted it out of the pot. 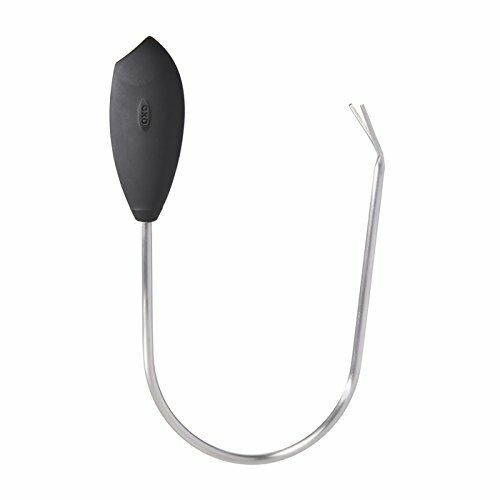 This gadget is perfect for this purpose but, along with the bay leaf, I forgot to use it! Set aside to cool, debone and cut into bits for the soup. Blended into a cream of vegetable soup. 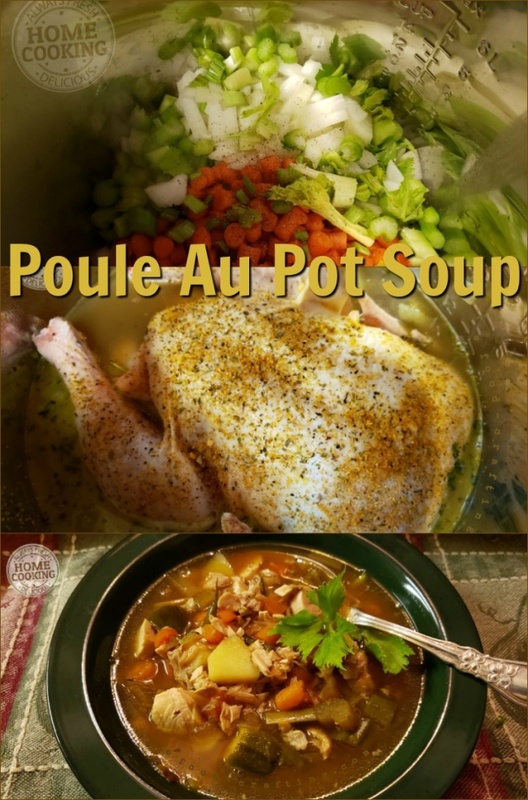 How popular is the authentic Poule Au Pot recipe? In France, it’s popular enough to merit its own bouillon cube. 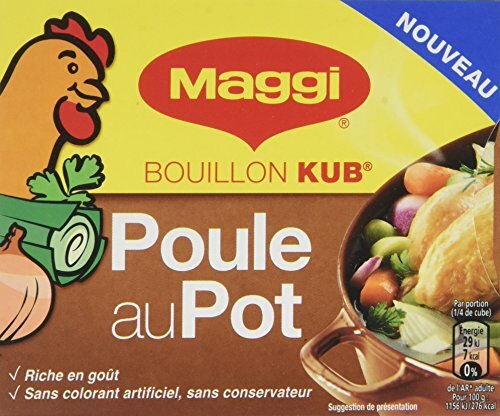 Maggi® also offers a bouillon cube for those who want to make Poule Au Pot soup! One recipe equals several meals with this easy meal prep! That’s what is great about this type of recipe. 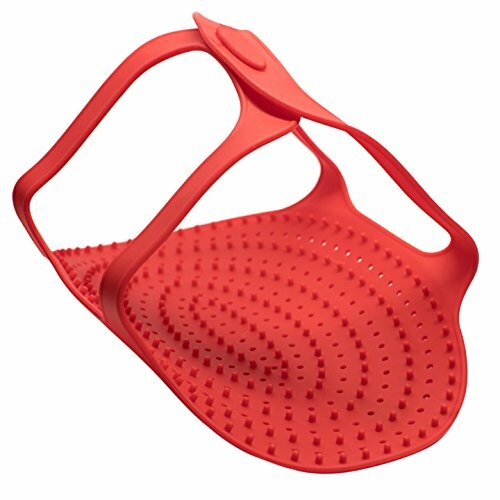 It makes enough soup for Mom (2 servings), several servings for the two of us as a dinner Entrée with toast and a salad but also lunch with a sandwich the following day! The best part? There is plenty of leftover chicken for at least another meal. In a favorite comfort food – Chicken Pot Pie! As a filling for deviled eggs or a perfectly ripe avocado? None of the above are very French but you have to remember that I cook to indulge all our favorite “cuisines” on both sides of the Atlantic. 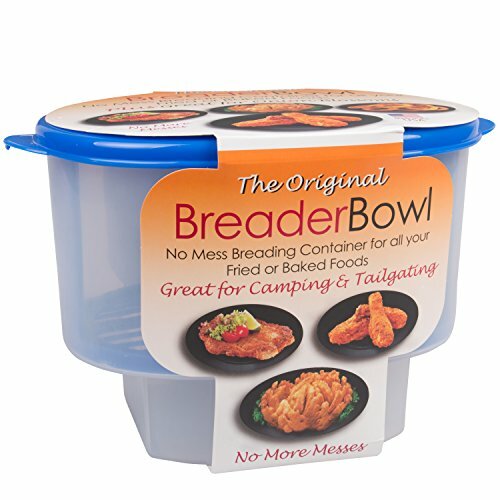 What’s your favorite way to use leftover chicken? 1.1 Does France Have A National Dish? 1.3 3 Ways To Enjoy This Soup! 2 Why Is Organic Chicken So Good For What Ails Us? Previous Post Braised Country Style Pork Ribs: Super Easy Recipe For Tonight’s Dinner! Next Post Farmers Market Chicken Salad: Margaret’s Popular Recipe Hometown Folks Still Talk About Today!